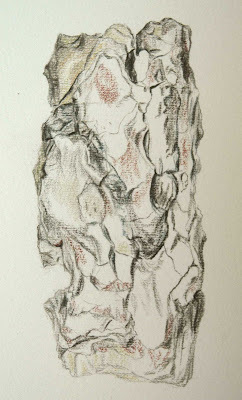 As I said, I've been drawing my bark with coloured pencil. It's not finished yet, Bertus won't let me draw. But when he's asleep in the afternoon, I have a few hours to draw a little. And after dinner there is also an hour left for me to draw. And here are the results of the first stages of the drawing. It's a difficult piece of bark with all these flakes. But that's what makes it interesting. First I have to draw the basic outlines of the hole thing. I added also some obvious shadow parts so I wouldn't get lost while I was drawing. The second thing I did was to add more shadows and add more colour in the shadow parts. This will give it more depth then just a simple gray layer. After finishing most of the shadow parts I started in one corner to layer colours and blend them together. Added more details to it. And that's where I am right now. Hopefully I can do a bit more today, although it is very warm today. We're playing outside most of the time today. 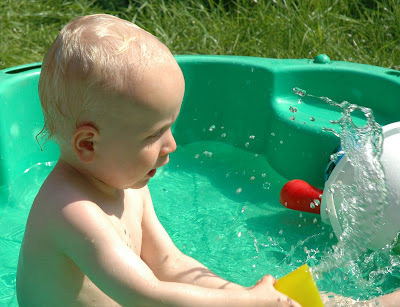 It's okay to sit in the shadow under the trees and Bertus can play with water there. 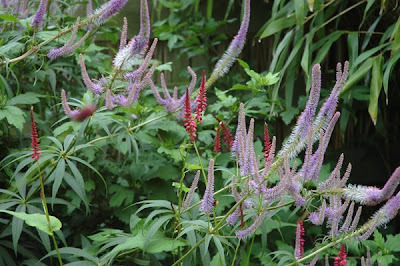 Veronicastrum virginicum 'Diana' is a smaller variety of my Veronicastrums. 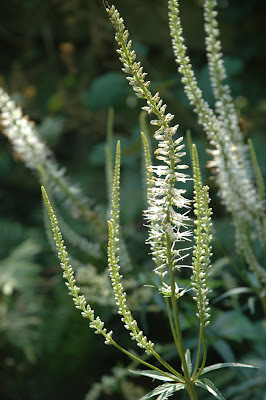 While the other, taller ones have barely any flowers left, this white beauty is just starting to bloom. It is standing in a spot where is more shadow. I guess that's the reason why. 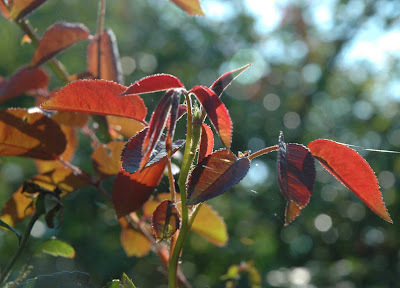 Another thing I noticed today is my Rosa Glauca. She thinks that it's almost autumn so it seems. 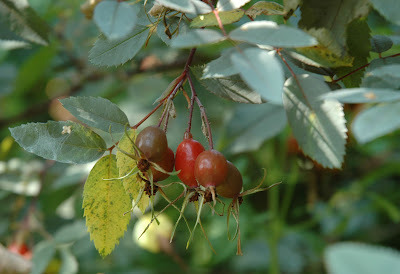 The rose hips are starting to turn red and dark, the leaves are turning yellow. 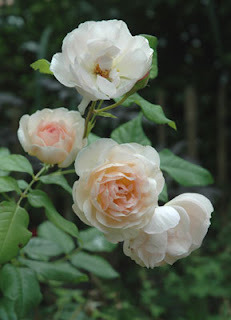 It's all going so fast in this dry and hot weather... Thankfully an other rose thinks it's springtime. 'Moonlight' is getting a lot of red young, fresh shoots and leaves. Beautiful to see it when the sun is shining through. 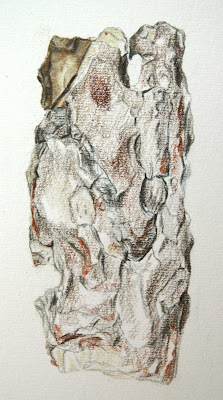 After all the fun that I had painting the piece of Pine bark, I've decided to do a coloured pencil version of it too. Not to compare the two of them (but I'm sure everybody will do that anyway), but I just think it will be better than the watercolour. Actually I know it will be better. It has to be better. 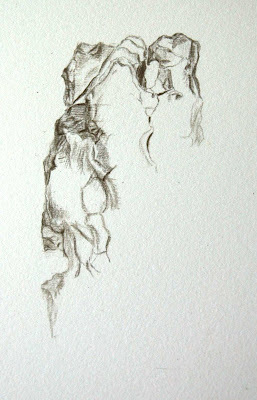 So I've started to draw the same piece of bark on a piece of Fabriano 5. The next few days will be filled with Bertus and this drawing. I'll try to take photos of the drawing while it progresses. Hopefully it won't be a big disappointment in the end. 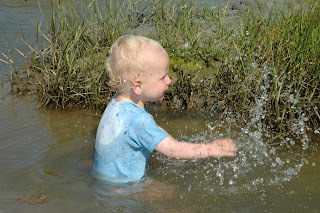 It's so much fun discovering Flickr and it's possibilities. Like the mosaic toy. I've made two mosaics now. 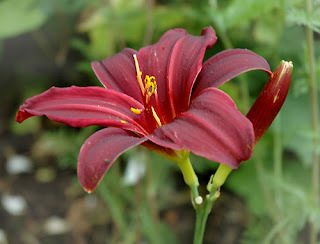 One of our stay on Schiermonnikoog and this one of the flowers that are flowering now in my garden. I love the colour scheme. I've already had some very nice reactions on my drawings and my photos. That's nice. 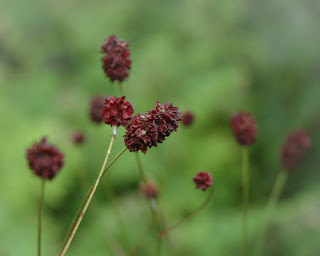 I hope some people will find their way to my blog as well. 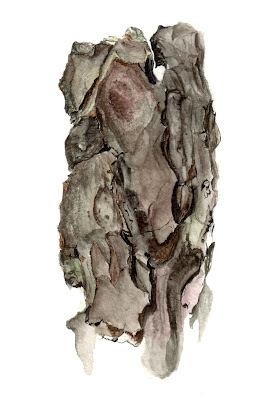 On the first day on Schiermonnikoog I found this piece of bark of a Pine tree. It was a perfect project for the moments we had to stay in our house. When Bertus was sleeping or when it was raining, or just a bit too cold to paint outdoors. It's not finished yet but wanted to show it to you anyway. It's a watercolour by the way. Something I normally don't do, only when I'm on vacation. Last week we were on vacation. 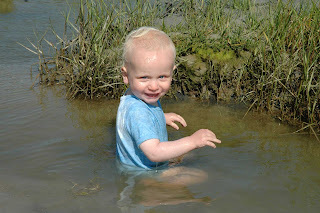 We went to an island called Schiermonnikoog. It's the most northern part of the Netherlands and not far from where we live. There are no cars allowed on the island so we took our bicycles. At the start of the week it wasn't very warm. 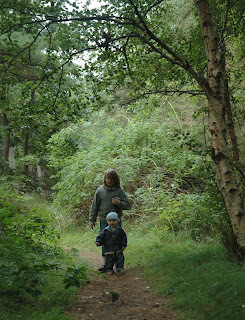 We had some rain at night and in the morning but in the afternoon we could go out and explore. 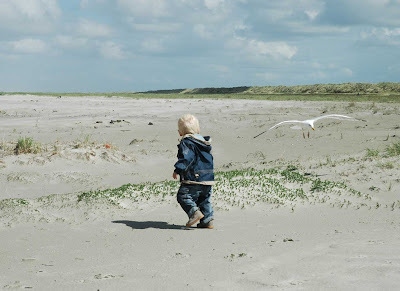 It was Bertus' first time to the seaside so we took him straight away to see the North sea and the beach. (on the photo above you can see Bertus having a close encounter with a seagull) It was very windy but that didn't mind a bit. 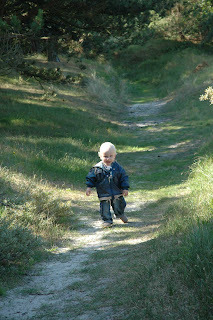 In the evenings Ward went with me biking through the dunes. 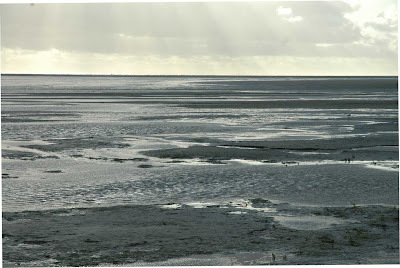 On one of the first evenings we went to the west coast of Schiermonnikoog to view the Wad. The sun was carefully shining through the grey clouds and it was low tide. 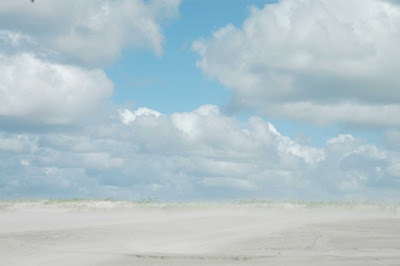 On the horizon we could see Ameland, the island next door. It was beautiful, Ward kept on telling me how wonderful everything was. And he was right! 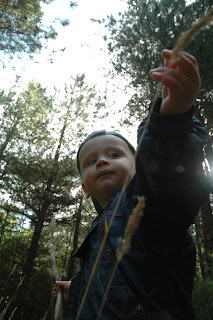 On Thursday morning Jeroen took Ward and Bertus for a walk in the forrest. According to the photo's they took and the stories they told they had a great time. Bertus wanted to do most of the walking by himself. Up the dunes and down the dunes again. Ward and I also went to the beach one afternoon to find some cockles. Ward found out a really good way to find them in the sand. Soon our little bucket was filled. That evening we had pasta with cockles on our plates. It was very nice. Bertus wanted to eat them all! The next day we had to go home (today). It's always a little bit sad to leave Schiermonnikoog. 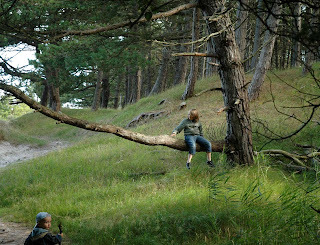 No cars, no computer, no work to be done, no television (although we had one in our small house)... Just nature, books, paint and each other. 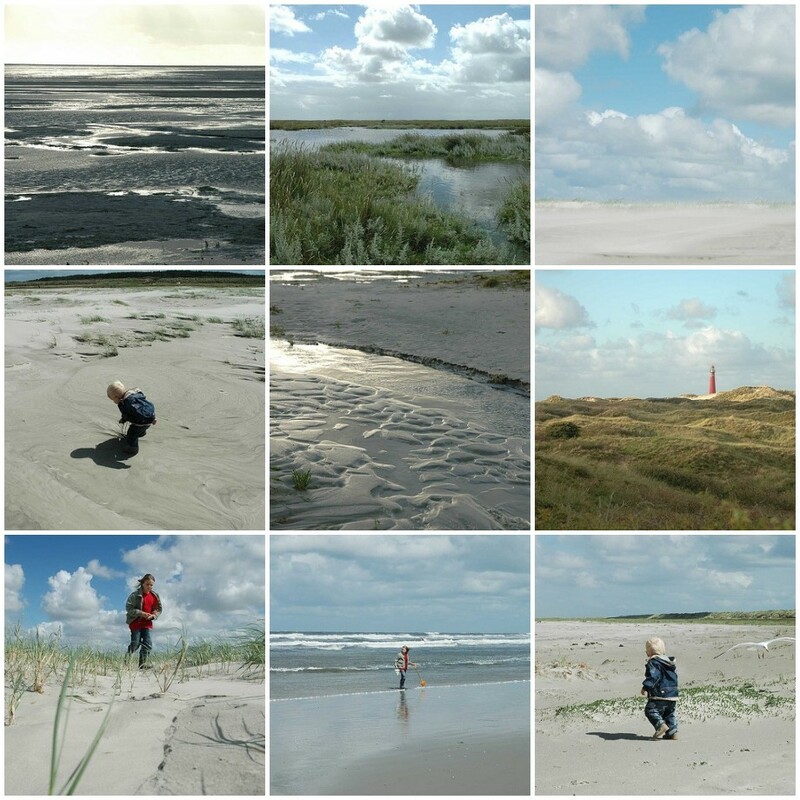 More photo's of our stay on Schiermonnikoog are on my Flickr photo stream. 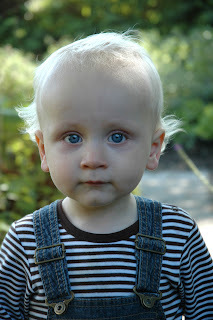 Meet my youngest: Bertus. Very naughty! 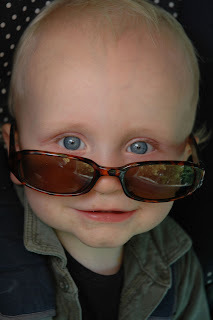 But also very cute with his mothers sunglasses. We are heading for Schiermonnikoog on friday. So blog you in about 10 days! I've been working on my blog to give it a better look. It's improving step by step. Today my brother, his girlfriend and their two kids came to visit. But although the house was full and everyone was quite busy playing, I did find some time to take some photo's in the garden. 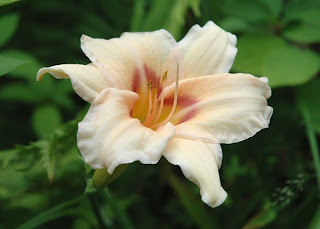 I discovered a Daylily that never bloomed before. My mother gave me this one last year. I thought that it was 'Catherine Woodbury', but apparently it's not. 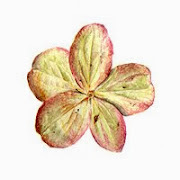 I don't know it's name. 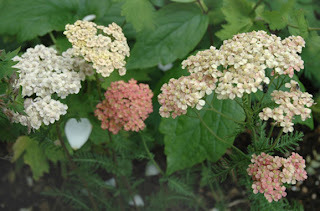 It looks a bit like 'Mama Cha Cha' or 'Coral Lace' but I'm not sure. 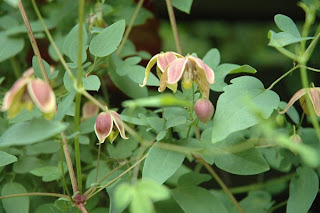 I also noticed Clematis 'My Angel' covered with tiny pretty flowers. 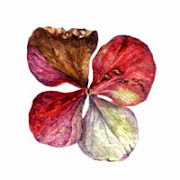 And what about this beautiful Hydrangea? 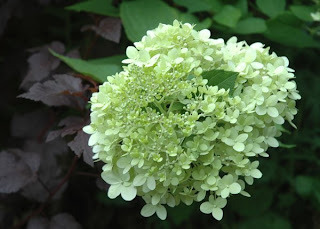 It's Hydrangea paniculata 'Limelight'. A very nice one. Big greenish white perfect flowers. Maybe I should tell you a bit about myself first. I live in the Netherlands (so please, don't mind the mistakes in my writing to much). I'm married to Jeroen and we have two boys, Ward (11) and Bertus (1), Yes I know, it's quite a gap... Oh, we also have two lovely cats Miep and Murk. You'll probably see them on some photo's in the posts to come. One of the things I want to share with you is my work. 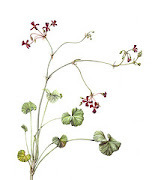 I'm a botanical artist. 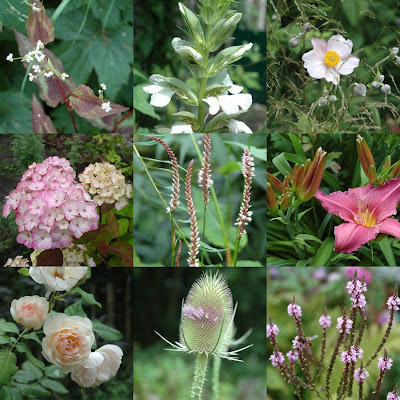 I love plants, I love to draw them, I love to plant them, I love to buy them, I love to read about them, I.... I guess I'm just a bit mad about plants. Anyway, as I said, I draw them. With pencil on paper. I also like to make drawings with colored pencils. 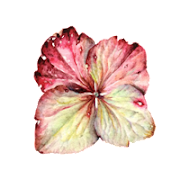 You can see some of my work on my website. 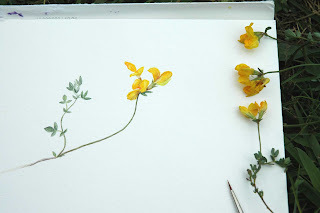 Here on this blog however, you'll probably see some of the struggles that go with the drawing. All images and text on this blog are protected by copyright law and may not be reproduced in any form without the author's permission.